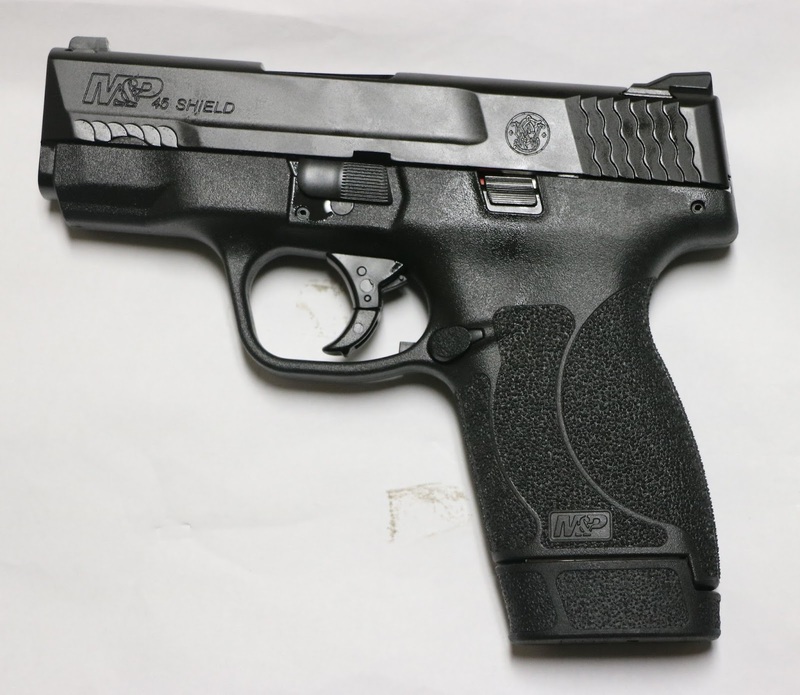 After toting Murph's S&W Shield 45 around New Orleans and shooting it at the range, I was rather taken with both how well it carried and how well it shot. Yes, I had to go out and get one for myself. Taking down the 45 Shield is the same as all other firearms in the M&P line - very easy. The barrel standing alone looks rather stubby and rotund, being chambered in the .45 ACP cartridge in a short 3.3" barrel. The 6 round magazine makes the gun fit in a front jeans pocket in a Desantis Nemesis holster reasonably well, appearaing just a little larger and a bit more of an outline than the Kahr PM9 and with the same capacity but 45 rather than 9. The Shield 45 with the 7 rounder as seen makes it a bit harder to do so and it doesn't fit nor conceal nearly as well, so it is better to keep that one as a reload in a pocket or mag pouch and carry it with the 6 rounder. So how did it shoot? 50 rounds of PMC and 100 of my 230 FMJ reloads later it had not a hiccup and the centers of a couple silhouette targets were shot out completely. Recoil felt like a gentle push rather than a smack, and it was very controllable with good accuracy. The grip surface fits the hand well and sticks perfectly without shifting while firing making it very easy and comfortable to shoot. The stock trigger is acceptable but nothing to rave about - especially when comparing it to my friend's HK VP9SK trigger. Then again, the Shield 45 costs half of a VP9SK out the door. Probably an APEX trigger upgrade is in order. 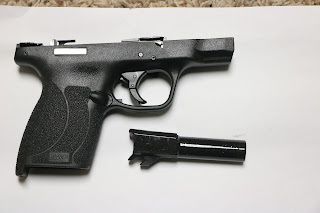 I'm going to shoot a goodly sum of hollowpoints, probably Federal HSTs, through it, and if it functions without a problem as expected it will become the carry piece of choice for warmer weather. If you like both to carry a 45 and have a compact shootable package to carry it in, the Shield 45 is well worth a try. Nice selection. Keep duplicating my armory so that when apocalypse comes and you all come down here to help me establish my new sovereign zone, we'll have commonality and you'll be able to help train my army of Amazons that I'll be assembling. The Shield is a good choice, I have the .40 cal version. It is very comfortable to shoot and I am using reduced recoil hydroshoks in the pistol. I have had to change my mindset because I now carry one in the pipe which in the past I didn't do except when I was carrying a revolver or an M16, LOL.